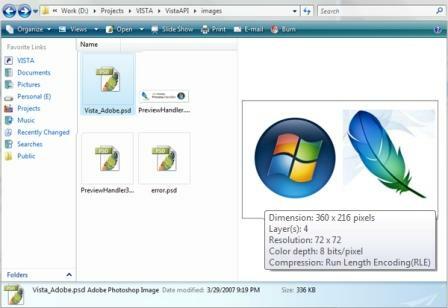 Professional photographers and graphic designers who frequently receive image files in Adobe Photoshop proprietary file format (.PSD) in email attachments or have to handle .psd files frequently can make use of Preview feature built into Windows Vista and Microsoft Office Outlook 2007. Most common graphics format such as JPEG, BMP and GIF has been supported out-of-box natively by built-in preview handlers, except PSD files. Luckily Microsoft allows developers to easily extend the preview handler capability to support new file format with Managed Preview Handler Framework. And, Photoshop Preview Handler has finally been created for users who wish to preview Adobe Photoshop .PSD file in Windows Vista Explorer or Outlook 2007 email attachments without actually open up the file. The Adobe PSD previewers will allow users to save time by displaying a thumbnail preview of the Photoshop image when the file is selected, without loading the resource-hungry Photoshop application. A readonly preview of the file will be shown in the preview pane. Dimension of the image and number of layers in the PSD file will be shown in the tooltip. Adobe Photoshop application will not be required. The previewer should also work for Outlook 2007 in Windows Vista. Adobe Photoshop PSD Preview Handler with framework can be downloaded from CodeProject. Also available is project’s source code, with full explanation for those who are interested.